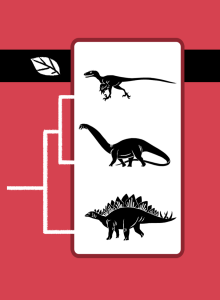 In Clades: Prehistoric, the sauropsids of the land are dinosaurs, specifically a feathered Utahraptor (a theropod), an Apatosaurus (a sauropod), and a Stegosaurus (an ornithischian). The earliest dinosaur precursors were two-legged relatives of crocodiles, as were the first theropods, sauropods, and ornithischians. Walking efficiently on two legs gave them an advantage over crocodiles, lizards, and early mammal relatives. Dinosaurs first appeared about 230 million years ago (Mya), after the Permian–Triassic extinction event of 250 Mya. The plant-eating ”bird-hipped” dinosaurs (Ornithischia) evolved greater size, and several lines evolved a four-legged gait, especially the frilled and armored dinosaurs. The “lizard-hipped” dinosaurs (Saurischia) developed into two major clades. The sauropods evolved long necks to eat tree foliage and large size to protect themselves against theropod predators. Their large size necessitated a four-legged gait. Theropods ate meat, and they, too, became larger over time. Theropods evolved feathers, and some developed flight. Some of these flying dinosaurs were the only dinosaurs to survive the Cretaceous-Paleogene extinction event of 66 million years ago. We call them birds (Aves). It’s easy to get the names sauropsid and sauropod mixed up. A sauropod (“lizard foot”) is one type of sauropsid (“lizard face”).